Chain Link Memorial Fence, 2002. Photo by Jeremy Smith. 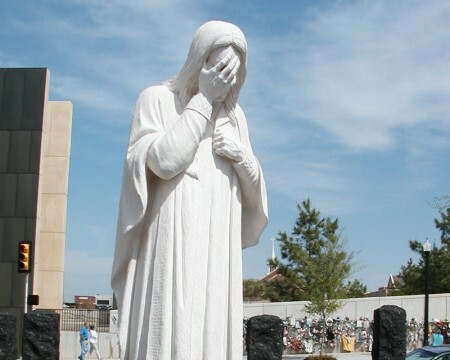 On April 19th, 1995 at 9:02 a.m., I was in keyboarding class at Putnam City High School, about 8 miles away from downtown Oklahoma City, knowing nothing of what madness was just unleashed from a yellow Ryder truck at the Murrah federal building. Our class kept on increasing our words-per-minute on our QWERTY keyboards even though the tension was mounting as the teacher was having hushed conversations in the doorway. Our class had it easier than others–one classmate remembers her teacher leaving the class altogether for a long time, scaring the students into wondering what was happening. In the days before cell phones, rapid communication couldn’t penetrate the walls between classes, and my class’s bad boy Charlie didn’t have his usual FM radio headphone hidden in a hoodie-covered ear to hear the news. The ringing bell–which began the walking break between classes–burst open the dam as students poured into the halls sharing what they heard in groups, folks leaving circles to start another circle, teachers holding each other’s shoulders. My classmate Trisha remembered seeing students crying in the halls, and one boy sobbing on the floor of principal’s office. That Tuesday was an odd day because students kept to the same classroom schedule even though teaching was not taking place and when the bell rang we sought out news or answers in the hallways. My classmate Diep remembered classmates asking a lot of questions.“How did it collapse like that? Could anyone survived that? What caused that?” It was a confusing time with so much speculation going on. The TV on the cart was important because it initiated the moment the news went from horrifying to personal. I distinctly remember when the TV relayed the information that a nursery was at the building. My heart stuck in my throat–my father was a clown who did children’s entertainment–could he have been working there that day at that nursery? When I went to school that morning, was he already in his work clothes? I couldn’t remember. I told my teacher and she said that they would call if there was a problem. My dad picked me up from school later that day–he was fine, but he had worked there in the previous year. The bombing became even more real the next day. My friend Daniel’s father was a first responder, and on the school bus he shared his father’s experiences of carrying people out of the rubble. Later that day, his dad was on cleanup and went to pick up someone’s shoe from the street and found a foot still inside it. For once our school bus wasn’t a place of bullying and awkward leg-touching–it was a community unified by horror. But my strongest memory was yet to come. At some point a day or two later, our family went to the bombing site and touched the now-iconic chain-link fence that was decorated with teddy bears, notes of encouragement, notices of prayers, and American flags. 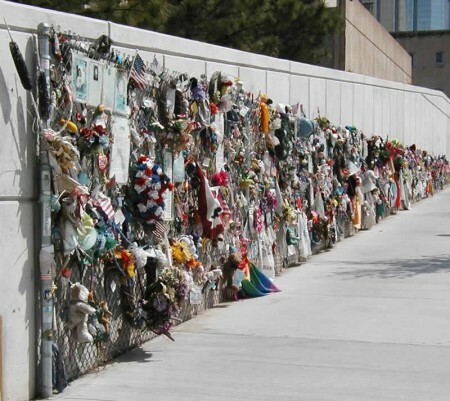 I was overwhelmed by the sheer number of notes and remembrances of the victims that folks had made on our Bible Belt wailing wall, especially the stuffed animals for the 19 children and infants who died. It was less than 72 hours of my high school years, and yet its memories echo into eternity. 05-19-2002, Jesus Wept Statue outside of OKC Memorial. Photo by Jeremy Smith. [Trauma] is an event that continues, that persists in the present. Trauma is what does not go away. It persists in symptoms that live on in the body, in the intrusive fragments of memories that return. It persists in symptoms that live on in communities, in the layers of past violence that constitute present ways of relating. Most of my classmates were 15 that day–the next half of our lives would be marked by mass murder in unlikely places in America. The Jonesboro shooting, Columbine school shooting, September 11th, the Virginia snipers, the Amish school shootings, the Virginia Tech shootings, and many other mass casualty events all took place before my class turned 30 and exited young adulthood. How’s that for a coming of age? Waking every day wondering what the news will bring. In a world of mass trauma, transmitted through mass instant communication, how do we heal? How do we move on when every news article re-opens the wounds? When we don’t know if the Twitter alert is “another one.” While hearing about trauma is not comparable to those in the traumatic situations themselves, there’s an echo of it that is shared across humanity. Ask any Baby Boomer and they can tell you where they were when Kennedy or Martin Luther King Jr. was assassinated, when 9/11 happened, when they heard about Newtown elementary shootings. Redemption in the abyss of hell is not about deliverance from the depths but, instead, about a way of being in the depths, a practice of witnessing that senses life arising amid what remains. [This] story is not a story of rising out of the depths , but a transformation of the depths themselves. Every traumatic event does not have to echo grief and trigger setbacks in recovery. It can, instead, trigger responses of love, beauty, effort to mend relationships, building of fences to honor the dead, writing of letters to loved ones. We can remain in love with our fellow humans even when we utterly fail one another. We lament, we bury our dead, and we seek new ways of being that render that form of death inert and powerless. I find more meaning in the fences, in the aftermath of trauma, than I do in the trauma itself and its unspeakable voids. It’s basic psychology: we can’t make meaning from trauma, so we often create it. But my understanding of Rambo’s work is that we ought to find our meaning in the way we remain “with” each other and in the ever-present response to the world’s failures of decency. Perhaps by caring for our fellow humans in increasingly more holistic ways, we can as a human race eradicate these inclinations and causations so that the traumas lessen in frequency and there is possibility for healing. 05-2002. World Trade Center Fence. Photo by Jeremy Smith. Seven years after that fateful day, the Oklahoma campus ministries of the United Methodist Church coordinated a mission trip from Oklahoma to New York City to do some urban revitalization and service. That was April 2002, about seven months after 9/11. 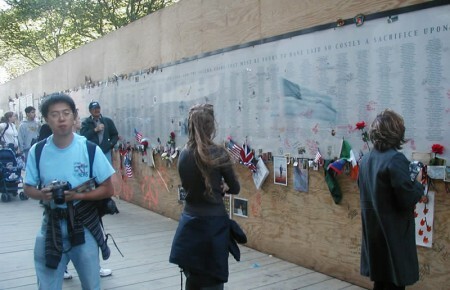 During the mission trip, our group of 30 college students visited the site of the Twin Towers. We stood in the back of a long line of people waiting to get close to the same type of memorial fence that surrounded the Murrah Building. As I walked in and touched that familiar fence, I felt the weight of his words. May we be the last that carry that burden. Leaves my with tears and the feeling that I have seen too much in my life.